Earlier this month, major category five (on the Saffir-Simpson hurricane wind scale) Hurricane Matthew destroyed lives (more than 1,000 perished) and property on its wicked path through the Caribbean and on up the southeast coast of the US, to the Canadian Maritimes. The responses of many ARESÂ® and partner entities are documented in the ARRL news stories linked below; many after action reports noting lessons learned are expected in the weeks to come. Northern Florida coastline was heavily impacted by Matthew; the eye wall brushed Daytona Beach, where I live, at around 1 PM Friday, October 7, with wind and gusts that toppled large trees, and ripped off shingles and roofs. The storm eroded beaches and took out coastal roads such as historic route A1A in Flagler county, just to the north of Daytona Beach here in Volusia county. Portable VHF FM station at K1CE, checked into the Volusia County EOC net on the ARES 147.24 MHz KV4EOC repeater, at the height of the storm, 1 PM, October 7, 2016.
performed flawlessly for the duration, taking and relaying reports of damage, and logistical requests. For example, issues with staffing and protocol at area Red Cross special needs shelters were handled and resolved over the repeater. The Daytona Beach city EOC, located at the city's police headquarters, was checked into the net by its station N4DAB, with operator ARRL Northern Florida Section Manager Steve Szabo, WB4OMM, at the helm. Szabo, a retired law enforcement officer, pulled 67 hours of duty there over the course of four days. He was able to monitor HF and VHF storm-related communications, and said "What I heard was capable, professional net control operation and excellent cooperation by the amateur community at large in keeping those frequencies clear for safety of life communications." Registration is open for the webinar "Overview of Army and Air Force MARS," October 25 at 8 PM ET (0000 UTC on October 26). US Air Force MARS Chief Dave Stapchuk, KD9DXM, will discuss the history of the Military Auxiliary Radio System (MARS) program and membership requirements for Amateur Radio operators. He also will highlight the Joint MARS Phone Patch network, which provides daily support to US armed forces. The phone patch network facilitates not only morale/welfare phone patches but routinely handles mission-related radio calls and occasionally assists US air crews with in-flight emergency phone patches when air traffic control cannot be reached. US Army MARS Program Manager Paul English, WD8DBY, will discuss the quarterly US Department of Defense (DOD) contingency communication exercises, which promote interoperability between the Amateur Radio community and the DOD. English will also discuss initiatives for promoting the use of 60 meters between Amateur Radio and the federal government as well as the types of information MARS operators will request from the Amateur Radio community during the upcoming quarterly DOD communications exercise (COMEX), October 30-November 1. Webinar registrants will receive a confirming e-mail that contains information about joining the webinar. The annual SKYWARN â¢ Recognition Day (SRD) will be held this year on Saturday, December 3, 2016. This is the day when Amateur Radio operators visit National Weather Service (NWS) offices and contact other operators around the world. The purpose of the event is to recognize the vital public service contributions that Amateur Radio operators make during National Weather Service severe weather warning operations. It also strengthens the bond between Amateur Radio operators and the local National Weather Service. The event is co-sponsored by ARRL and the National Weather Service. Please remember that this is not a contest, so no scoring will be computed. Object: For all radio amateur stations to exchange QSO information with as many National Weather Service stations as possible on 80 through 10 meters, including 6 and 2 meters bands and the 70 centimeter band. Contacts via repeaters are permitted. Date: National Weather Service stations will operate December 3, 2016, from 0000 - 2400 UTC. Exchange: Call sign, signal report, QTH, and a one or two-word description of the weather occurring at your site. Modes: National Weather Service stations will work various modes including SSB, FM, AM, RTTY, CW and PSK31. While working digital modes, special event stations will append "NWS" to their call sign (e.g. NØA/NWS). Station Control Operator: It is suggested that during SRD operations, a non-National Weather Service volunteer who is a licensed radio amateur serve as a control operator for the station that is set up at a NWS office. New this year: There will be a new log submission process introduced this year, and W1AW at ARRL Headquarters is scheduled to be on the air for SKYWARN Recognition Day. More details will be released later. More information about this event may be found here. The second IARU Region 2 Emergency Communications Workshop was held October 11, 2016 in ViÃ±a del Mar, Chile in conjunction with the IARU Region 2 XIX General Assembly. Sponsored by IARU Region 2 and the ARRL, the workshop was chaired by Mike Corey, KI1U, ARRL Emergency Preparedness Manager and IARU Area B EC. Co-chair was Dr. Cesar Pio Santos, HR2P, IARU Region 2 EC. Topics covered the use of Winlink, SATERN support for Salvation Army disaster response, the role of ITU, developing operator and communications skills, AREDN mesh networking technology for disaster response, and emergency communications response in Venezuela. â¢ Increasing the capacity for Amateurs in Region 2 to respond to large scale, multinational communication emergencies. â¢ Provide an opportunity for national level Amateur Radio emergency communications leaders to network and increase the level of cooperation and collaboration within the IARU Region 2.
â¢ Build upon topics and discussions from the previous emergency communications workshop and about specific events that transpired since the first workshop. For more information and photos from the workshop, please see the IARU Region 2 website. The morning of June 25, 2016, presented a sweltering 86 degrees and rising, with humidity over 50%. This year, Field Day was a combined exercise of the St. Charles County (Missouri) ARESÂ®, sponsored by the Emergency Communications Association of St. Charles County (ECA), and the county's Division of Emergency Management (DEM) under the county police department. ECA/ARESÂ® and the DEM have enjoyed a long, cooperative relationship for many years. In January, a new communications trailer project was rolled out, with the finished product tested extensively in June's dual exercises. The trailer, provided by the county Police, was repainted, adorned with decals, and improved with air conditioning, radio benches, and windows. The trailer has five operating positions: Two positions are fitted with amateur VHF/UHF FM equipment (Yaesu FT-8900 transceivers), with packet radio capability at one position. The third position is fitted with amateur HF with an Icom IC-706 transceiver. Positions four and five are reserved for public safety systems (Motorola XTL 2500 VHF and 800 MHz trunking radios). A computer network is installed with peripherals. 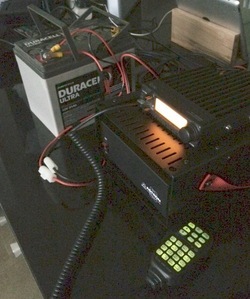 A 6500 watt generator powers the systems, along with a 12 V battery backup system. the electrical system, computer network, roof antennas, radios, the front mounted push-up pole and other assets to make the trailer a working mobile communications platform to be shared by ECA, DEM, and the county Police. A week before Field Day, the emergency management division purchased a tower trailer, which was equipped with a 60 foot square telescoping tower, a 10 kilowatt diesel generator and an equipment cabinet. The main purpose of the exercise, held in conjunction with Field Day, was to field test the new trailer, tower trailer and new equipment in a potential real-world infrastructure support role where communications is impacted by natural and man-made disasters. ECA/ARESÂ® operators worked most of the states, provinces in Canada, Hawaii and Puerto Rico over the Field Day weekend, demonstrating the potential use of HF radio in national infrastructure support. Three antennas were demonstrated in the 2A category-configured stations. 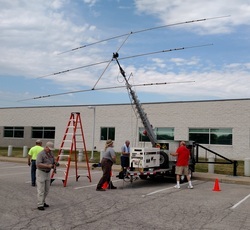 A tri-band beam was mounted atop the 60 foot tower and a dual band (40/80 meters) wire dipole was suspended from a stand-off at the top of the tower. A multi-band NVIS antenna was also deployed and demonstrated. Instruction was provided by the Division of Emergency Management on the deployment and use of the tower trailer. The County Police Department granted use of its media room at the department headquarters to run the second station. The 10 KW generator powered the communications trailer station; the second station was battery powered with generator backup. The team of seasoned operators did a fine job of collecting QSOs to demonstrate capabilities. The relationship between the Division of Emergency Management and ECA/ARESÂ® in St. Charles County Missouri has been mutually beneficial and cooperative. Just a few weeks prior to Field Day some St. Charles County ARES members were asked to participate in a tabletop exercise in the St. Louis County EOC for the purpose of establishing parameters for the design of the new St. Charles County EOC. The scenario was an F3 tornado touching down in Weldon Spring, Missouri, cutting a path of destruction through eastern St. Charles County. This was a familiar scenario to some who responded to the real thing just two years before. ECA/ARESÂ® served as the sim cell in this exercise and provided recommendations for the new EOC. According to Bill Grimsbo, NOPNP, District C District Emergency Coordinator and St. Charles County EC, "In my 20 plus years with ARESÂ®, I have never seen cooperation in any other county or city that compares with the levels of St. Charles county. The St. Charles County Division of Emergency Management and the County Police Department are true partners with ECA and ARESÂ® in response and preparedness to a degree I've never experienced." This relationship is set with a Memorandum of Understanding that became an ordinance between ECA and St. Charles County DEM signed in 1998. 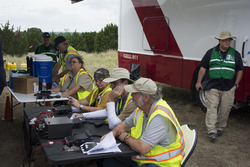 Williamson County (Texas) ARES members were integrated with the county's Emergency Communications, Office of Emergency Management, Sheriff's Office, and other partners for a planned full-scale exercise dubbed Basic Assessment of Interoperability of Telecommunications (BAIT), held June 24 and 25, just prior to ARRL Field Day 2016 at the county park in Liberty Hill, Texas. All county emergency communications mobile assets were deployed to the park to simulate a complete failure of public safety communications infrastructure. Objectives included remotely dispatching public safety units within the county and integrating Amateur Radio communications into the process. The team of county telecommunications employees and Amateur Radio operators, under the direction of Incident Commander Lt. Aubury Holmes, KG5FTD, began setting up base camp two days ahead of the exercise. ARES members erected four portable Blue Sky masts and installed antennas covering HF bands. They set up an amateur HF station in the county's Regional Mobile Communications (RMC) truck. Williamson County Communications Director Scott Parker, KE5OJC, established goals for the exercise, including having the Resource Unit maintain full accountability of resources and personnel on site, to monitor public safety resources remotely, and to dispatch fire, EMS and law enforcement from the remote site. In addition to radio and antenna deployment, ARES members were tasked with setting up and operating a generator trailer and HF go-kits with PACTOR 3 capability to full functionality. Another goal was to deploy APRS systems to track assets on the park property in real time, creating "breadcrumb" trails showing where units had been. Part of the park lies in a river valley beneath a bluff that could inhibit radio transmission from the canyon, so ARES members set up a crossband repeater on the rim of the canyon and an APRS digipeater, enabling the Incident Management Team (IMT) to reliably track search and rescue (SAR) assets and communicate with them from the Command Post. Fire Departments conducted the SAR maneuvers -- each team was outfitted with an APRS tracking device so leaders could monitor the progress of the search. The digipeater successfully relayed tracker information to the Command Post. Twenty-nine Williamson County ARES (WC-ARES) members filled many of the Incident Command System Command and General Staff positions on the IMT. Seasoned IMT members provided guidance upon request, but ARES personnel functioned at a high level. WC-ARES Emergency Coordinator Terry Jones, K5LGV, served as Operations Section Chief, and John Peek, KF5ZMD, served as Planning Section Chief. Other ARES operators exercised skills they would need if they were ever called upon to fill dispatch positions in the public safety environment, as well as all the technical skills required for a remote communications operation. Communications vehicles outfitted with amateur HF radios were sent out to surrounding counties with ARES members operating the radios. They tested coverage without using repeaters to confirm the ability to get traffic from a 100-mile radius. Band conditions were less than optimal and yet successful contacts were completed after mobile antenna configurations were modified. knew that environmental conditions would be extreme with temperatures near 100 degrees, so keeping personnel hydrated was a concern. Meeting nutritional needs of such a large staff was challenging. The Salvation Army brought their canteen truck to the site and provided lunch for the participants. 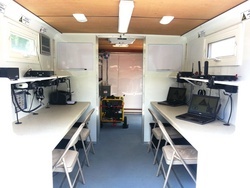 Williamson County Communications had already provided a trailer for ARES use, outfitted with dual band radios, HF capability, and 800 MHz trunking public safety radios. 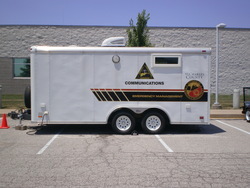 WC-ARES personnel remodeled the trailer, turning it into a two-room communications center. This platform provided a second air-conditioned operating position. The Capital Area Trauma Regional Advisory Council (CATRAC) participated by providing an RV trailer for the check-in point and a box trailer with a 45 KW generator that became a 2-meter packet and HF PACTOR operating position. CATRAC also provided and set up an air-conditioned DRASH tent for the command team that was used for the GOTA station during Field Day activity. The Travis County Radio Emergency Associated Communications Team (REACT) provided their 3DRobotics Solo quad copter for aerial surveys and for search and rescue. On Saturday, June 25, the operation transitioned to Field Day activities, all taking place in the air conditioned comfort of the equipment set up for the exercise! A Williamson County Commissioner, county parks director, and county Public Information Officers visited the base camp and observed the exercise in operation. At one point on Saturday, there were 74 people on site including visitors and participants. 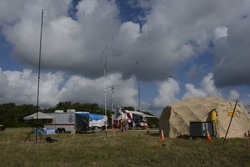 ARRL South Texas Section Manager Lee Cooper, W5LHC, visited the site and observed the exercise. Local television station KXAN came to base camp for a story on the exercise. Local newspapers also provided coverage. This full-scale ICS exercise required a daily Event Action Plan, and provided exposure to and practice with essential ICS forms. It provided an opportunity to familiarize ARES members with the ICS processes involved in any Type I or Type II incident. At the end of Field Day all equipment was taken down, packed and returned to service. Each team member went through the demobilization process as if they were on a major incident. This exercise gave ARES members a chance to meet or deepen relationships with various officials from around the county, and to share our passion for radio with them. "I didn't expect APRS to be a big part of Field Day," said WC-ARES Board Member Jonathan Estill, AF5DF, "but I became an expert in configuring several trackers used during the exercise. Williamson County purchased several different APRS radios, ranging from Byonics and SainSmart trackers, and Kenwood TH-D72A and TM-D710GA radios for tracking assets like SAR teams in emergencies. The trackers provided near real-time position updates about teams deployed beyond the base camp." Planning is a very detailed process. Assign teams specific tasks during setup so that multiple evolutions are taking place simultaneously. Carefully observe personnel in hot conditions for proper hydration and exhaustion. When band conditions are poor, find a way to make communication work. What ICS classes are needed for personnel to fulfill the mission? Logistics is a key position that needs to be closely involved from the start. Austin, Texas -- In our Community Emergency Response Team (CERT) training classes (2 or 3 times a year) I make a short presentation about communications, how it is necessary with some understanding of the need and how to be of service with Amateur Radio support. At the conclusion of the session, the students can sign up for licensing classes. We now have several amateurs in the CERT ranks. In a recent CERT meeting, a show of hands indicated about 50% of those in attendance were licensed and members of local clubs and ARES. Our CERT classes are normally hosted in the city/county EOC where the amateur station is also housed. I have been involved with the City of Austin CERT from its inception, and help with administration, leadership, and teaching. Other response organizations share needs and should have the same opportunities for learning and participating to be communications prepared. To help in this direction, we are building a cooperative Council of organizations in our ARRL South Texas District 7 (8 counties) to be able to adequately communicate and be stronger together in any situation. Visiting this year's ARRL New England Convention in Boxboro, Massachusetts, I was delightfully surprised at the level of care most attendees, and in particular exhibitors, speakers and volunteers, exercised in their choice of attire. Snazzy uniform shirts worn by vendors were in abundance. Business attire infused the exhibit hall. It was as if I were attending a professional conference. There I met new ARRL CEO, Tom Gallagher, NY2RF, whose sharp business attire transmitted an easy-on-the-eyes message, one that clearly respected the first impressions of his constituents. Among the subjects discussed was my contention that our community must take better care to present ourselves as organized professionals when serving in a public service role, most especially in how we look. As a leader of public service teams, and an advocate for better leadership, innovation and national unity in our public service communications role, I make sure every volunteer has the opportunity and support that encourages their personal success. Not only are my teams well trained and fully integrated into the organization or agency we serve, they also look (and smell) good. That's because expectations for attire are part of the pre-event preparations. I urge volunteers at some events to be "smartly dressed with a clean white shirt and blue uniform pants, or equivalent." 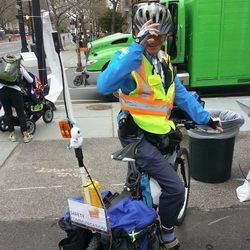 A volunteer T-shirt is sometimes needed as an added bit of identification and to unify us as members of a larger team, so I request that we "wear the supplied volunteer T-shirt in combination with uniform or EMT cargo pants to present a professional appearance." I also caution that we must not be confused with public safety or law enforcement personnel. "Professional" does not mean that we have license to impersonate, however innocent our first intention! responsible for an invitation back to a repeat performance. So what happens when we're not? Some of us lean upon that tired "when all else fails" excuse: "When all else fails you'll call upon us, and you won't care how we look." Weak. Irrelevant. Arrogant. Please throw those rags in the laundry (or incinerator) and come back civilized. This is not a mud wrestling match. For the third year in a row, ARES/RACES was a featured part of the largest gathering of tribal disaster preparedness, recovery, hazard mitigation, and homeland security professionals in the country. This annual conference is organized by the National Tribal Emergency Management Council, and was hosted on September 19-23, 2016, by the Tachi-Yokut Tribe at their Santa Rosa Rancheria in Lemoore, California. Two local San Joaquin Valley (SJV) Section groups, the Fresno ARES/RACES and the Tulare County ARES pooled resources and set up a special event station (N8V) with multiple operating positions (voice and data) on the lawn adjacent to the conference hotel. Hal Clover, AD9HC, SJV Section DEC, wrote, "Many conference attendees stopped by to view the display. Radiograms home were offered with several being sent via operators at the event." As part of the pre-conference activities on Monday and Tuesday, Larry Taylor, KF6JBG, taught a Technician license class. Newly licensed amateurs were Jason Sisco, KM6FKK, environmental systems with the Tachi-Yokut Tribe, and Scott Mercer, KM6FKL, security officer with the Tachi-Yokut Tribe. On Wednesday, following the Opening Drum by the Tachi-Yokut Tribe, NTEMC Chairman Richard Broncheau, KG7NRJ, gave the conference welcome address, and NTEMC Executive Director Lynda Zambrano, KE7RWG, provided a NTEMC "Year in Review" summary. In the afternoon, Adam Geisler, KJ6YHN, of the La Jolla Band of LuiseÃ±o Indians was one of the panelists at an open discussion forum about FirstNet, The First Responder Network Authority. After dinner, the conference attendees were treated to a series of excellent traditional tribal dances courtesy of the Tachi-Yokut HOOPS Youth Council Traditional Dancers. The "Breakout Sessions" on Thursday included "National Tribal Amateur Radio Association" by Nathan Nixon, N7NAN, Public Safety Programs Director with the Inter Tribal Council of Arizona; "FirstNet's Second Steps: Real world applications for tribal emergency response" co-presented by Rita Mooney, KG5JAT, Texas Department of Public Safety, and Adam Geisler, KJ6YHN; "Introduction to CAMEO", a free suite of software applications used to plan for and respond to chemical emergencies, co-presented by Elisa Roper, KM4BUG, Tribal Liaison with FEMA Region IV; and "Administration for Children and Family Services - IDCM" co-presented by Wendi Ellis, KK6WQO, Regional Emergency Management Specialist in FEMA Region IX. Featured on Thursday afternoon was the "Tribal Coast to Coast Exercise" co-hosted by Nixon. Simulated emergency messages for an earthquake scenario were sent via Amateur Radio from the conference special event station to FEMA Region II in New York. On Friday, Suzanne Everson, KI7EGE, Regional Emergency Management Specialist, Administration for Children and Families, spoke about "Increasing Tribal Human Services Preparedness" at one of the breakout sessions.